Highland Prep features robotics competition teams in VEX Robotics, SeaPerch Robotics, and Zero Robotics. Design System offers students an exciting platform for learning about areas rich with career opportunities spanning science, technology, engineering and math (STEM) by creating with VEX Robotics technology. Beyond science and engineering principles, VEX Robotics encourages teamwork, leadership, and problem solving among groups. It also allows educators to easily customize projects to meet the level of students’ abilities. The affordable VEX platform is expanding rapidly and is now found in middle schools, high schools, and university labs around the globe. Robotics hobbyists also appreciate the advanced capabilities of the VEX Robotics System. High School Competitions: Teams compete regionally and at state qualifiers from November through February. The state championship competition is in March. The national championship competition is in late spring. 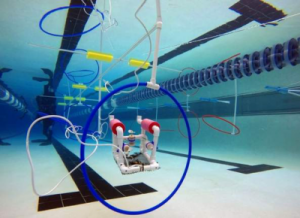 The SeaPerch Program is an innovative underwater robotics program that equips teachers and students with the resources they need to build an underwater Remotely Operated Vehicle (ROV) in an in-school or out-of-school setting. Students build the ROV from a kit comprised of low-cost, easily accessible parts, following a curriculum that teaches basic engineering and science concepts with a marine engineering theme. Building a SeaPerch ROV teaches basic skills in ship and submarine design and encourages students to explore naval architecture and marine and ocean engineering principles. It also teaches basic science and engineering concepts as well as tool safety and technical procedures. Students learn important engineering and design skills and are exposed to all the exciting careers that are possible in naval architecture and naval, ocean, and marine engineering. High School Competition: Teams compete in a national competition held in May. Zero Robotics is a robotics programming competition where the robots are SPHERES satellites inside the International Space Station. The competition is online and teams compete to solve an annual challenge guided by mentors. Participants can create, edit, share, save, simulate, and submit code, all from a web browser. After several phases of virtual competition, finalists are selected to compete in a live championship aboard the ISS. An astronaut will conduct the championship competition in microgravity with a live broadcast! The programming competition is sponsored by NASA and MIT. High School Competitions: Teams compete in preliminary rounds from September through December. This competition is open to teams from the US as well as from ESA participating states (in Europe).